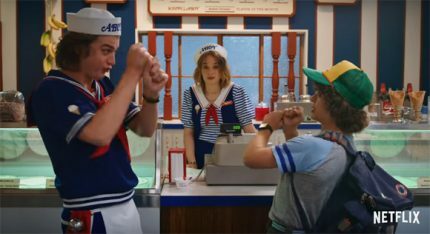 Home › Stranger Things › ‘Stranger Things 3’ Trailer Teases Monsters, Malls, & Mullets! Watch! 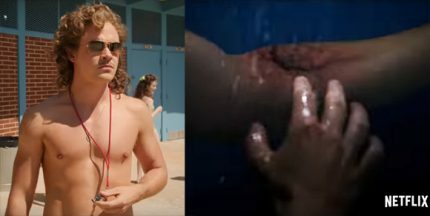 It’s going to be a hot, strange summer in Season 3 of Stranger Things! Netflix just dropped the first trailer for the upcoming eight-episodes, which is due to be released on July 4 — a holiday release date that’s perfectly paired with the season’s summer setting. Related: Everything Coming & Going On Netflix In March! The short clip reunites us with all our favorite characters as they enjoy (for now) their summer vacations. 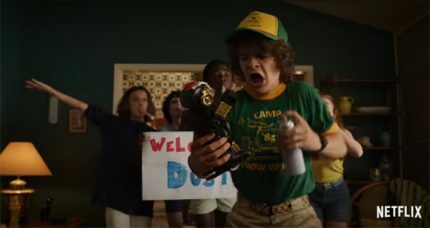 Dustin (Gaten Matarazzo) has returned from summer camp and gets cutely pranked by Mike (Finn Wolfhard), Lucas (Caleb McLaughlin), Will (Noah Schnapp), Max (Sadie Sink), and Eleven (Millie Bobby Brown). Bike rides, trips to the mall, and scenic walks to the tune of Baby O’Riley ensue. But it’s not all fun and games — and we’re not even talking about the monsters looming ahead (we’ll get to that in a second): the core kid group is starting to grow up and drift apart. “We’re not kids anymore,” Will narrates at one point. Steve (Joe Keery) has lost major cool points now that he works at the local ice cream parlor and is apparently still best friends with Dustin. Because, of course, Hawkins’ idyllic summer is ruined by whatever the f**k is being churned out by the nightmarish, otherworldly dimension that apparently can never be closed up all the way, no matter how many nosebleeds Eleven gets. This time, the gang isn’t dealing with a regular Demogorgon, or a Lovecraftian Demogorgon overlord… they’re taking on a MEGA MUTATED Demogorgon! And we’re sure this ugly beast is just the tip of the Demo-berg. There’s a lot more going on in the trailer: Hopper (David Harbour) and Joyce (Winona Ryder) dance around the idea of being together, small business owners boycott the town’s new mall, Lucas’ younger sister Erica performs a Die Hard-esque vent crawl, and Eleven does some major screaming in the vast nothingness that is the Upside Down. Ch-ch-check out the Stranger Things 3 trailer (above) and catch the new batch of episodes on Netflix July 4th.